Someone you know going over the hill? Send them a unique over the hill birthday balloon bouquet to celebrate! 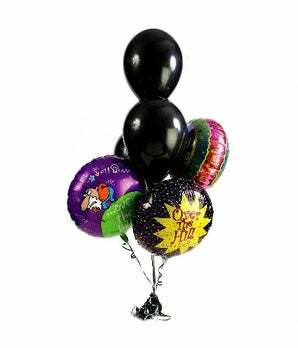 This florist arranged balloon bouquet is delivered with three black mylar balloons paired with three over the hill themed latex balloons. Let someone know you're joining them as they turn 40 with this playful over the hill balloon delivery.